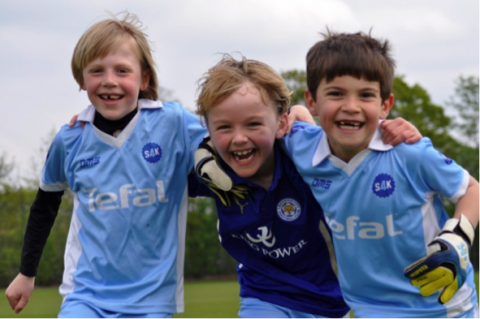 Kids’ sport boosts self-esteem, learning and life skills - Sport4Kids Football Coaching, Child Development & Girls Football Blog! Smiles are a definite sign of self-esteem! It is common knowledge that regular exercise gained through playing sport is great for kids' developing bodies and their physical fitness. In fact the NHS guidelines state, "to maintain a basic level of health, children and young people aged 5 to 18 need to do at least 60 minutes of [moderate to vigorous] physical activity every day." These recommendations tell us that vigorous activity, which makes you breathe hard and fast, "is linked to better general health, stronger bones and muscles, as well as higher levels of self-esteem." Let's look at that again: listed along with the other benefits is 'self-esteem'. Not only can vigorous activity improve physical fitness (the NHS recommends playing chase, dancing, swimming, running, gymnastics, football, rugby, martial arts and cycling), these activities can improve a child's mental fitness as well. In this blog I'll be looking at psychological techniques including mindfulness, positive thinking, intelligent performance, purposeful practice and ways to nurture a growth mindset, which can all help to develop this mental fitness. For a child to achieve a level of proficiency in any kind of sport requires an emotional commitment; participating in group activities from an early age helps children to develop and control the emotional, behavioural and social skills that are needed to operate as part of a team. This generates self-esteem and is valuable when transferred to other areas in life, especially when the youngest children start school. Poor self-esteem resulting in a lack of confidence, on the other hand, is one of the main factors that inhibit learning, along with fear of failure and learned helplessness. 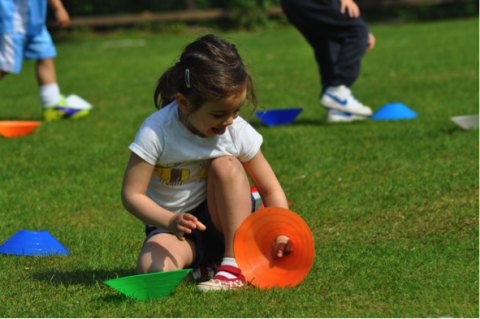 "We aim to build confidence in children through engaging them in sport and physical exercise." 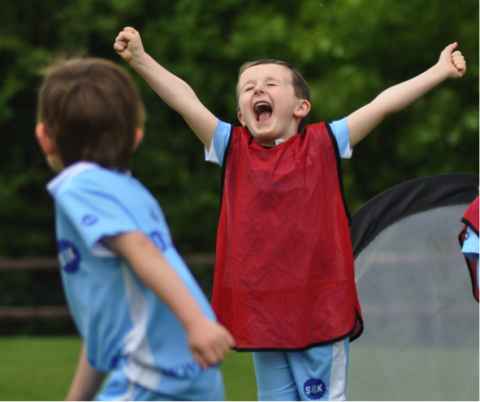 Confident children learn that satisfaction is gained not only from a winning result, but also from acknowledging the effort they made to keep on playing well and the pleasure of participating in the game, win or lose. Improving motor skills for coordination requires concentration. 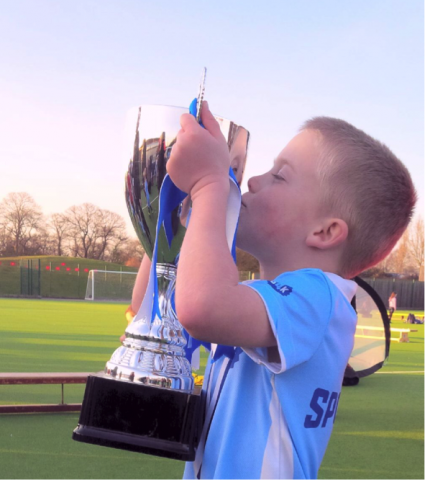 Playing sport helps children achieve that positive state of consciousness when mind and body are united: experiencing the energising effect of 'flow' or being 'in the zone.' When a child is completely focused during an activity they are acting solely in the present moment but intrusive thoughts can spoil this effect. Dwelling on previous mistakes or imagining future scenarios could put a player off their game and using Mindfulness can help prevent this occurring. The popular practice of Mindfulness is based on Buddhist meditation and relaxation techniques used in yoga. It can be applied in many different situations that require concentration and involves recognising any distracting thoughts, labelling them as helpful or unhelpful, then letting them go and returning attention to the task in hand, rather than allowing them to affect performance. Sports psychologists have determined several factors that benefit an athlete's mental stamina and resilience. This depends on developing self-confidence, a sense of internal motivation and discipline, maintaining focus and concentration, and overcoming the distraction of stress and anxiety to remain controlled under pressure. Apart from sport, when it comes to academic tests, GCSE or A level revision, it's clear that these are all psychological attributes that could lead to success in exams as well as on the pitch. Coaching (providing a motivational climate), arousal regulation (to relax or energise), goal setting, imagery (visualisation), pre-performance routines, and self-talk are all methods that sports psychologists use to help professional athletes learn self-awareness and improve their performance. These are useful techniques that can be adapted and habituated from a young age to help children establish positive thinking. If you come along for a free taster session you will notice how they are incorporated in a child-centric way into S4K's entertaining games and activities. 'Building Learning Power' is an inspirational teaching programme that has been adopted by many UK primary schools to improve learning attitudes. Based on the work of cognitive scientist Professor Guy Claxton, children are taught to recognise and demonstrate Resourcefulness, Reflectiveness, Resilience and Reciprocity, all essential qualities for independent, lifelong learning. In his latest book, 'Intelligence in the Flesh' Claxton considers humans' fundamental 'embodied intelligence' and examines the way our brains and bodies, thinking and doing, are linked and champions the value of 'intelligent' practical and physical performance. Claxton explains that rather than just having bodies, we are our bodies, and it is primarily through our bodies that we connect with the world around us. "The predominant association of intelligence with thinking and reasoning isn't fact; it is a cultural belief – a virulent meme, some would call it – that misdirects us. Young people who prefer doing intricate things with their bodies – breakdancing, skateboarding – to doing their maths homework are not lacking in intelligence." From babies to adults, experiencing the world and expressing ourselves through physical activity is something that all people do. Practising sport is the way many people excel at it. By giving children the opportunity to try out many different activities we can help them to discover where their 'embodied intelligence' lies. Working on that ‘can do’ attitude. "The brain changes and develops throughout life – a process called neuroplasticity. Certain experiences cause new connections in the brain to form or strengthen, making the brain smarter by literally rewiring it." Neuroscientists support the idea that our brains are constantly changing. Our thought-processes affect our choices and behaviour, yet how often do we stop to consider the way we think? The power of positive thinking is demonstrated in the concept of Growth Mindset developed by Carol Dweck, a psychologist at Stanford University. In Dweck's 2014 TED talk she explained that students with a 'Growth' Mindset (who are not afraid of being judged and are prepared to engage with their mistakes) are better learners. Her evidence shows that a person's achievement is affected by their own belief about their ability. 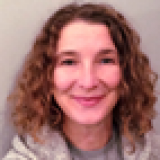 She advises that people who understand that their ability can change over time are more likely to accept a challenge, and rather than fearing failure, students should see it as a normal part of the learning process. A 'Fixed' Mindset has the opposite effect. Children with a fixed mindset are under the impression that being 'smart' or good at something comes naturally, you shouldn't need to try. To change this negative thinking you would need to show them that it's the 'trying' that helps you to learn. It's sometimes hard not to feel embarrassed or ashamed about making mistakes, but when children are afraid of criticism from parents or peers, they can end up with a 'don't try, can't fail' attitude. Growth Mindset methods are increasingly used in schools all over the world to assist with children's social and emotional learning. One of the simplest ways to make a difference is to consider the ways that children are praised. Instead of telling a child, "You are really good at this," you can praise their effort, "You've been working really hard at this and I can see the improvement!" Explain that your brain is like a muscle and exercise (both mental and physical) will make it stronger. All the neurons inside are busy making connections and learning new things actually changes your brain. Set suitably challenging tasks. Don't lower your expectations, but let children experiment and learn from their own mistakes. Praise effort over ability. Remember: if they can't manage a particular task yet, they will be likely to do it later, especially if they keep on learning and practising. Be positive about failure. Show them that making mistakes is a part of everybody's learning process. Share some of your own experiences when you struggled to overcome a problem but never admit to being 'rubbish' at anything! Consider how you are judging success: your reactions will influence your child's future behaviour, and it's easy to for children to become labelled either positively or negatively at an early age. Reward achievement carefully. You want your child to want to feel the intrinsic satisfaction gained through learning, rather than seeking constant validation from others. Do regular winners tend to ‘rest on their laurels’? At Sport4Kids the separate skills and techniques being taught are part of a carefully considered and designed Player Pathway. This means that each child's progress is carefully monitored and recorded by coaches and parents using their Practice@Home books.As children are promoted through the different performance levels they are awarded certificates of achievement. Even though some children may have a natural talent suited to a particular sport, without putting in some hard work and enough hours of practise this talent may be wasted. A talented child with a fixed mindset is at risk of becoming complacent. If they become used to the idea that they don't need to try and are not stretching themselves, they are not likely to achieve their full potential in the long term. "You are born with a certain level of talent. Not everyone can win the Olympics, no matter how hard they train. However, everyone can improve with a structured and consistent training programme." Based on studies of elite performance, journalist and author Malcom Gladwell wrote about the importance of having the opportunity to practice early and often when he defined a '10,000 hours' rule for success. Top sports performers train hard to stay fit. Even those who are naturally physically advantaged are competing with the best in their field and use purposeful practise to stay ahead of the game. For the majority of people who enjoy non-professional sport but are unlikely to ever be the best, staying motivated means working within their capability and endeavouring to achieve a personal best. That feeling you get when it all comes together! We all want our children to do well, and we can show our support by giving encouragement and celebrating their achievements. Keeping them on-track might mean reminding them to listen to their coaches, to refill their water bottle, or to take a deep breath and stay calm. Providing opportunities by joining clubs and taking them to competitions are useful ways parents can help to progress their talent. It's important to keep a balanced approach: a child whose parents do everything for them may doubt their own ability and find they are not able to cope independently; a child with extremely pushy parents may feel pressurised and worry about making mistakes. Much of the S4K pedagogy for Early Years is based around the Montessori method that encourages independent learning. 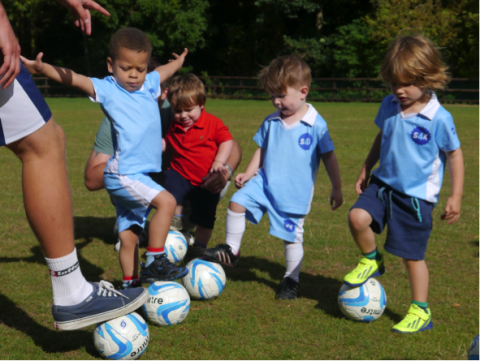 By providing classes for younger children, S4K aim to boost their fundamental movement skills through enjoyable experiences, which in turn builds confidence and raises that all important self-esteem.